Update on my herbs (pics). 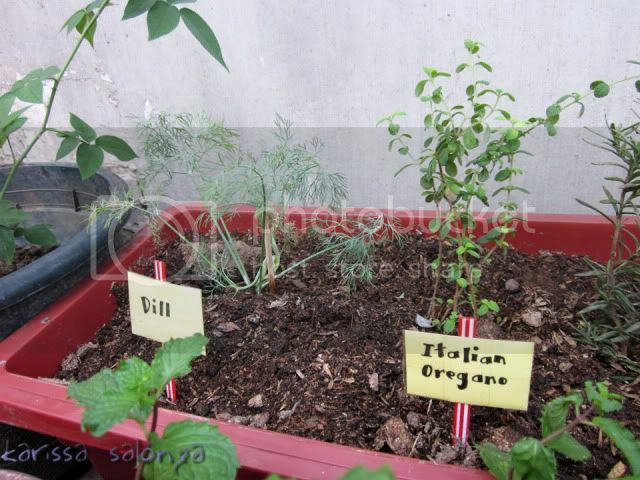 Well I just wanted to show you how my herbs are growing. I know that I have some over population of herbs but I want them to grow some more and then I'll get rid of the weak ones. 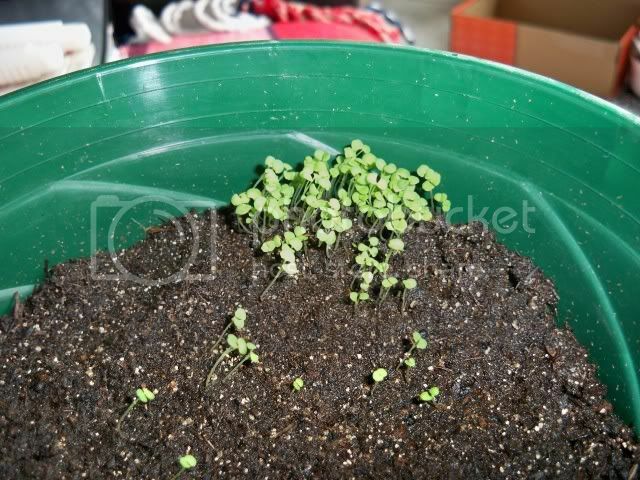 About the thyme I will see if I have to transplant it or maybe I will solve the problem somehow. 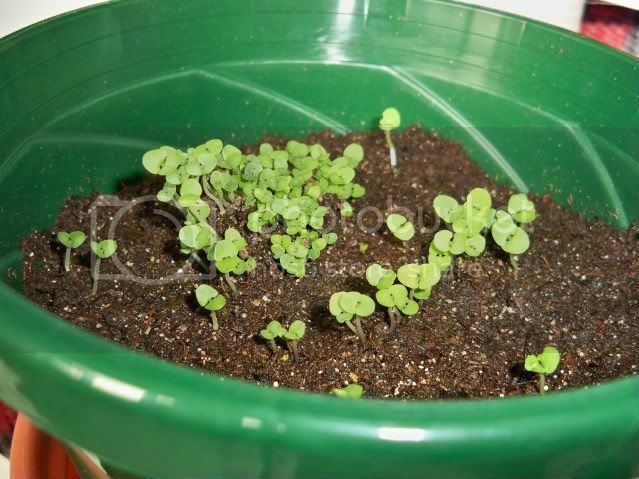 And just some lettuce that I've been growing and just sprouted. Very nice, but way too many seeds, too close together. As soon as they put out their first true leaves, you have to thin a bunch out or they will all die. With them so crowded the best thing to do is take a nail scissors and cut the stems at the bottom, so you don't disturb the roots of the ones you want to save. Yes I don't know if you've seen my other posts but I'm a newbie at this so I made some mistakes but I'm willing to learn, like I said I'm waiting for them to grow some more and then get rid of the weaker plants. Thyme will be fine like it is. 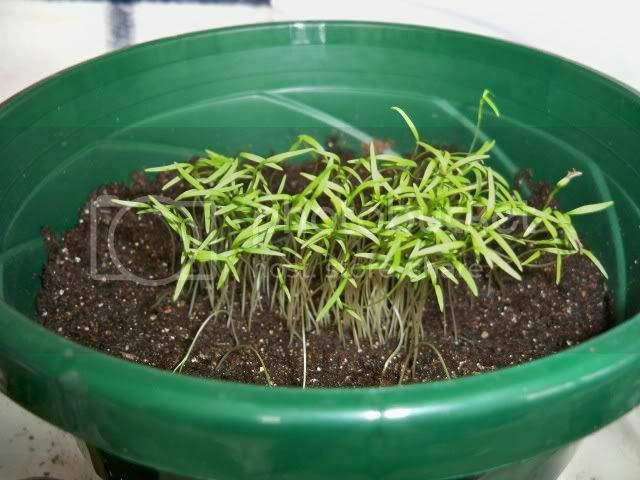 Dill transplant in groups of about 5 to 8 plants will be good. Basil transplant so it is groups of about 5 or 6 plants. Hi, thanks for all the tips. 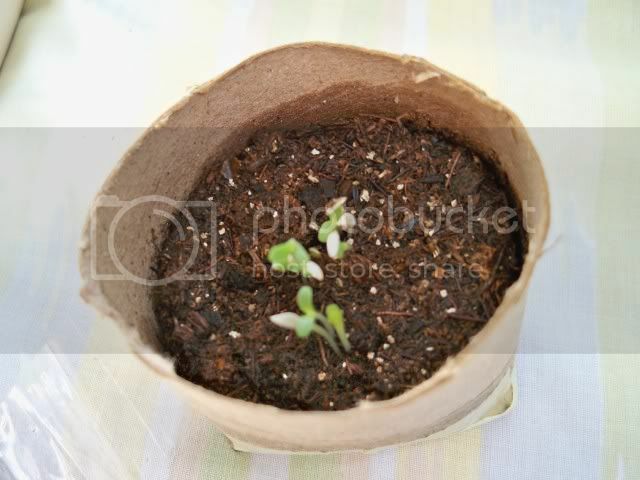 I was wondering if in the future when I transplant them, can I put diferent kind of herbs in a rectangular pot, like in this picture?. Or is ii to much trouble. With them so crowded the best thing to do is take a nail scissors and cut the stems at the bottom, so you don't disturb the roots of the ones you want to save. The best thing to do would be to take them all out at once and put them in a bucket of water. The water will separate the plants and you can repot them all without harming them. Dany_mex wrote: Hi, thanks for all the tips. Sure, but remember to give them plenty of room. I put one or two basil plants in a two gallon container. Basil gets pretty big! The thyme is creeping so you can put some around the edges and it will drape over the sides. 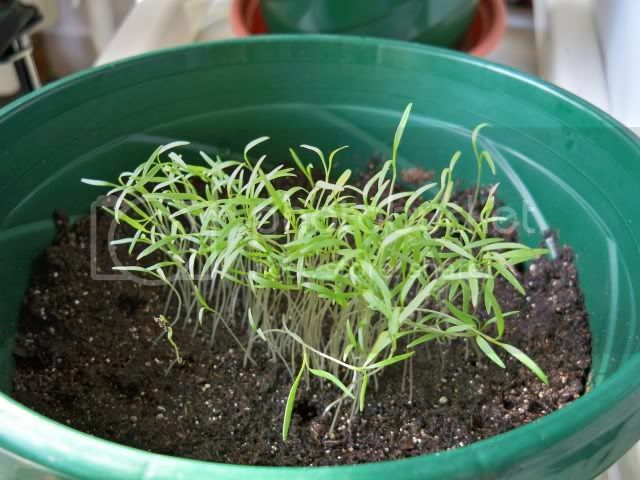 Dill is tall and skinny, good for the middle of a pot with other stuff around it. Great!, you've been so helpful!!. One other question about that water thing for the roots to separate. When I do that, I just put how much water?, like 4 or 5 inches of water and for how long?. It was a good suggestion from SageH. The suggestion was "a bucket of water," but it wouldn't literally have to be. 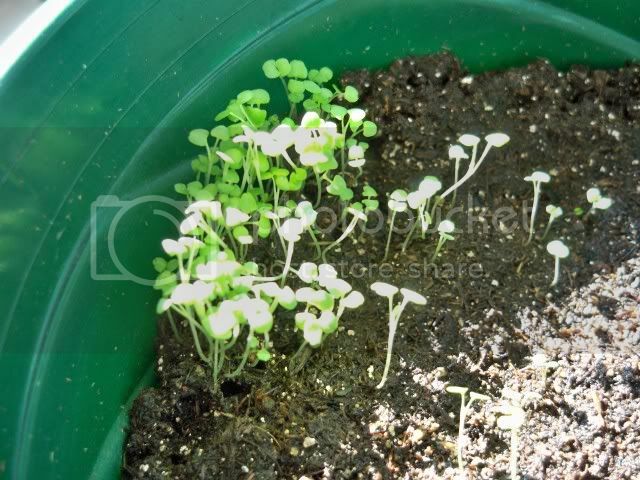 But the idea is you want a good amount of water and plenty of room for all those seedlings to separate themselves. 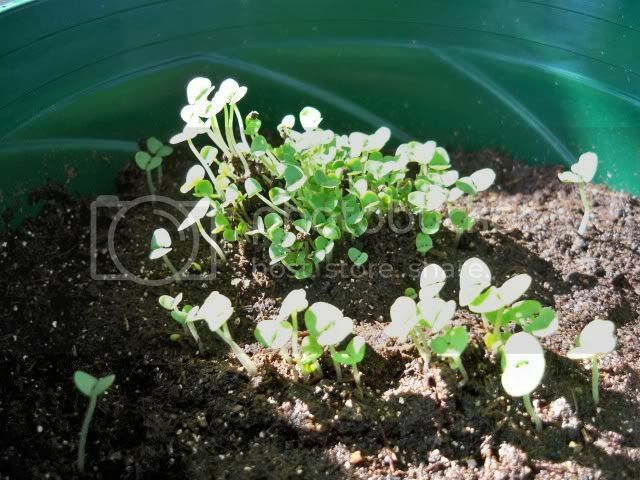 However, that would be a great thing to do IF you WANT all those seedlings and have room to transplant them all, giving them space. Since that seemed a little unlikely to me, is why I suggested just snipping a bunch off.